SouledOut's Meditation Focus theme for the 2015–2018 annual cycles culminates on the mountaintop of Capricorn as we embody our awareness of the zodiacal energies of the Lighted Way relating to Cosmic Freedom Inaugurates Planetary Liberation. Annually, we prepare now to align with the cycle's planetary hierarchical meditation beginning each year at the December Solstice, in preparation for the outpouring of spiritual energies at the upcoming Wesak event. Throughout the current lunar cycle surrounding the full moon during Capricorn, we ask all in our subjective group, according to your inspiration, to utilize the materials presented here as seeds for the daily meditation ritual. Following the cycle's new moon, we begin on Saturday, December 8 to focus on WeCycle Wisdom our monthly alignment around the full moon festival during Capricorn. "What do we identify as?" is the conscious choice we each make, every day. We practice identification with the highest aspect in all and actively express this, in our service in the world. When the shift of our consciousness is away from identifying with the lower forms of experience into that of identification as the real and true Self, the ability to tread the middle way between the pairs of opposites and the capacity to use the intuition are expressions of this identification. Eventually each human light masters the third initiation, mounting the cardinal cross. For all disciples having previously passed this initiation and aspirants in preparation for it, each and every day there is call to take or retake the initiatory tests in which we prove our capacity to demonstrate the quality of Soul in our service. We now resolve to do so, ever more earnestly and consistently than before. From the perspective of our planet, at this time in evolution we are becoming cognizant of the third Great Approach, "... which will bring the new revelation, with its realised consequences, of a new heaven and a new earth." (2) Humanity's identification is called to further alignment with the Divine. The third initiation, the Transfiguration, marks the fusing of soul and personality. 2015's March equinox initiated our journey for that cycle's spiritual year, as we share now rounding the corner from 2018 into 2019 in yet a higher alignment to Purpose for our service for the annual cycle. The revealed quality of Synthesis relates largely to the Life aspect, that which enlivens all forms. Synthesis is. (5) This is so, according to the Essential Divinity of all life. Recognizing this truth, we are called to surrender ~ to be the Divine Path through the sacrifice of all that is extraneous. Becoming the Path itself refers to our construction of the connecting channel between the outer, concrete world and the inner planes of the abstract ideal (6), linking us to the larger, cosmic perspective. This is an outgrowth of the ongoing sacrifice we make in service to the One. Capricorn's mountaintop portends our identification with the highest light beyond the soul, that of the monad, the father aspect in the trinity of Father ~ Will, Mother ~ Matter, and Son ~ Soul. In conjunction with our Weekly Meditation Focus being shared on WeCycle Wisdom, these various links also expand upon the topics featured on this overview. The Buddha and the Christ As they blend, the Love and the Wisdom of these two great teachers unite east and west, bringing enlightened alignment to those world servers who recognize this union. Cosmic Identification Through the practice of identification with the Divine Life itself, we may begin to comprehend more fully the nature of Spirit. The LifeThat which lies behind and synthesizes spirit, soul and form ~ The One Life that created all form, and this Life is experiencing and evolving through all created forms. It is the One Life experiencing through all of humanity, planets, solar systems, galaxies ~ All that Is. And when we have finished our sojourn on the evolutionary ladder, it is the One Life to which we shall all return and the realization that THAT is what we were all along. Monadic Consciousness We attune to our Monadic essence ~ "We are THAT and THAT are we." Principle of Essential Divinity Essential Divinity is the inherent quality underlying the Life aspect ~ all that is. Principle of Unanimity In one's life expression there comes a time when the unity and essential oneness underlying the dualities of physical plane life can be recognized and shared. The quality of this essential oneness has been termed "Unanimity." The Spirit of Sacrifice Sacrifice essentially means, to make holy. This is the hallmark of all world servers. As each individual unit takes responsibility for applying their highest alignment to Purpose, one's life becomes the Path, itself. This is an outgrowth of the ongoing sacrifice we make in service to the One. All we know, we need to apply now. We suggest you pause at points in the Meditation, wherever you are naturally inclined, to allow the energy and information to come in fully, and to be at one with the energies invoked. 19:40, including a musical interlude, and ending with The Great Invocation. We link up with people of goodwill everywhere, as part of the united group channel through which the spiritual forces can become available. Affirming this channel, "We stand poised united as One Soul with our Spiritual Hierarchy." We hold the focus. 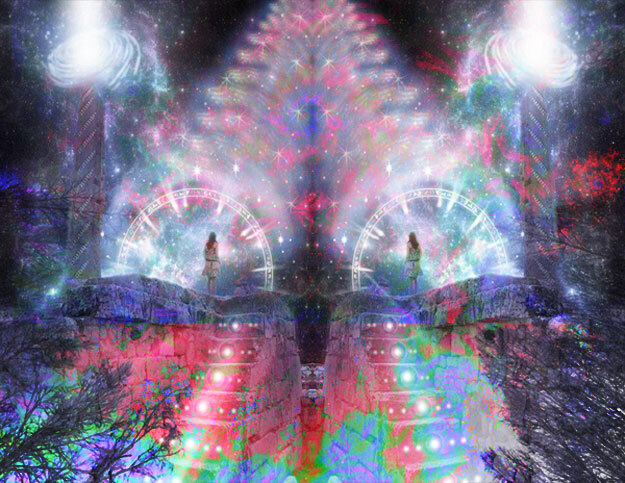 We now visualize and become the Chalice we have together created, as a grid of light all over the earth connecting the light of every Lightworker and each sacred energy vortex. This network serves as a conduit through which the heavenly blessings may flow through every one of us and to the planet Earth. We rise as one, seeking the light. In response, the great gateway that is Capricorn swings open wide and this Light pours into and through us. We know the energy of Capricorn signals a cycle of effort. Before us, the mountain ... and we begin to climb. We are ascending on a channel of pure Love. We sense a love far beyond personal attachment, one of Love and Service for all of Humanity. In this pure Love we subdue matter to Divine Use and Purpose, demonstrating Christ consciousness. The Love illumines us and we clearly see within, the integrated personality fused with the Light of the Soul. In an act of focused Will we lift the Soul unto the One Soul, and then unto the Light of Life itself. Monadic consciousness comes now alive within us. We see the world and its many realms, anew. Inspired by Love and guided by our Spiritual Hierarchy, our service is further revealed. 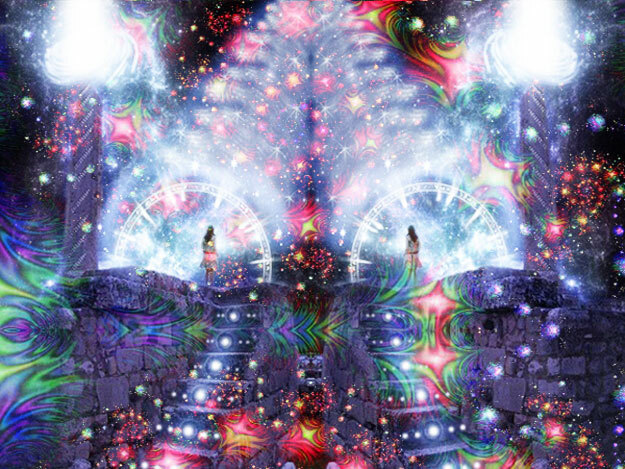 We work as the Transmitting Will, stepping down the energies made available by Divinity. Bathed in Divine Light, we stand at the mountaintop with our Spiritual Hierarchy. In this most high place, we see the golden threads of our evolutionary progress revealing our past work, our present Service and our Divine Destiny. Together, we are a brilliant orb of light that shines out in all directions. So potent is the Light that it shines far beyond our solar system, out of the Milky Way galaxy, and into the cosmos. We sense that our united connection reaches deep into the universe. It's up to us to radiate The Glory of The One. Whatever we choose to do will have great and far-reaching consequences ~ both here on Earth and throughout the universe. Capricorn Zodiacal Deity Symbolized by the Mountain, Capricorn awakens us to the higher frequency of spirit and the nonform. "In Capricorn we have the triumph of matter; it reaches its densest and most concrete expression; but this triumph is followed by that of spirit. There is full expression of the earthly nature in Capricorn, but also immense spiritual possibilities." (13) Initiation is the result of this process. December Solstice The Winter Solstice occurs each year on December 21. At this time each year the Christ energy enters the Earth, infusing our world with the ideal of perfection and the desire for a re-merging with the One. As the light returns, we may join the Spiritual Hierarchy in beginning their meditation to prepare for the coming Wesak. Capricorn Labor of Hercules "The light of life must now shine forth within a world of dark," begins Labor X of Hercules in Capricorn, in which Hercules slays Cerberus, guardian of Hades. Freedom, silence, and impersonality mark the Capricorn challenge to climb the mountain and then descend into hell. Lunar Theme: Expanding Conscious Awareness ~ The arrival of Comet Wirtanen & The Solstice "This December 7, 2018 New Moon nests in mid-Ophiuchus [*]. It conjoins the Heart of Ophiuchus ... the head of Hercules ... his shoulder, the head of northern Draco ... [3 stars] of Scorpio, and the Great Attractor galactic supercluster ... Hercules stands upside down in the northern Heavens, north above Ophiuchus and under the watchful eyes of the Dragon, with his feet (foundation) in the realm of the gods (the celestial dome), and with his head and hands at work in the realm of humankind [Map] ... Comet Wirtanen [*] arrives ... just after the arrival of the newly discovered Comet Machholz-Fujikawa-Iwamoto [*] ... Comets are heralds ... excit[ing] the constellations ... the stars and planets they [pass] ... Solstice occurs on December 21 ... in the high-energy crescendo leading into the [Dec. 22] Full Moon ... December Solstice marks the start of the new astronomical year. Both events conjoin and stimulate Earth's Precessional Cross, bringing emphasis to our current evolutionary transition ... " - Nick Fiorenza gives insights to this lunar cycle, which begins December 6, 11:20 pm PST and ends January 5, 5:28 pm PST. Scroll the link to learn about the North's winter solstice. at midnight, its emanations stimulate our crown chakra. Additional links These readings may be of assistance in your Capricorn meditation focus. If possible, we suggest being in meditation at the exact time of the full moon. For this meditation, and as each is able to join the world group at the time of the full moon (Saturday, December 22 at 9:49 am PST / 17:49 UT), it's suggested to begin meditating earlier so to be in deep meditation at the exact time, and then continue for as long as you feel compelled. We at SouledOut.org will align for this global meditation at the Sagittarius full moon festival. We also encourage utilizing SouledOut.org's Global Meditation in group formation at the exact time of the full moon, and whenever possible during this festival's safeguarding cycle. Consider what is the appropriate way to join in this meditation ... you may wish to participate in group formation on the physical plane as well as on the inner planes. Whether or not you choose to be "alone" on the physical, know you are uniting with many others who also are attuning to the energies available at this Global Festival, and that this group focus creates a powerful channel for our meditation service to be potent and effective. We now continue to hold the high space throughout this most auspicious day of the full moon, an important time to still the mind and maintain inner peace, a time of spiritual retreat and contact. If you wish, feel free to continue use of this meditation for the entire month of Capricorn. From new moon to new moon, Saturday, December 8, 2018 through Saturday, January 5, 2019. The Christ Light In many lands and civilizations this time of year has been associated with the coming of a Sun-God to save the world ~ bringing light and fruitfulness to the earth, and bringing hope to humanity. (17) This energy is honored and recognized by many spiritual traditions and is not uniquely Christian. Christ, the son of God, indeed did come to us in the dark of the year and initiated a new era, wherein light was to be the distinguishing note: "I am the light, I am the way." This Lighted Way is the illumined path to the Divine and the means to evolve right human relations. One with The Divine When the Planetary Logos connects with the Solar Logos, Shamballa ~ or the Will of God ~ is their point of union. (18) We are called to connect there with Them, and in this way to embrace the Plan of Love and Light. Transformation~Pluto Following its transit through the constellation Scorpio, Pluto now moves through the constellation Sagittarius and the sign Capricorn. The Lunar Messenger, Capricorn Full Moon (PDF) Circle of Goodwill's commentary for Capricorn, "Vistas of Wisdom 73: Sacred Trees"